With UNIMAT 1 "anyone can build a miniature size scale of the entire world". Dollhouses with perfectly-scaled furniture, historic ship models with turned railings, or gear wheels and a new axle for the radio-controlled car. 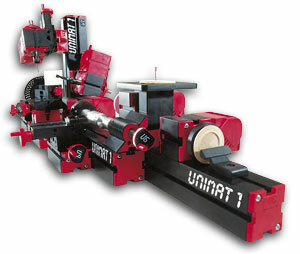 Because of its modular construction system, UNIMAT 1 can be assembled into six or more different machine tools, each no larger than a simple sheet of paper, within seconds. The machines have the same features as big industrial machines, the only differences are their size and the 12V drive. With 12,000 rpm, UNIMAT 1 is capable of forming metal, wood and plastics into any shape. Included in the kit are the components for a jigsaw, diverse variations of woodturning machines , a handheld sander a stationary sander, and a handheld drilling machine. All the machines of the UNIMAT 1 BASIC kit are child-friendly. Due to the short strokes of the jigsaw blade, the fingers of a young carpenter cannot be injured. At the same time, professionals are delighted by the accurate and precise cutting of the saw. 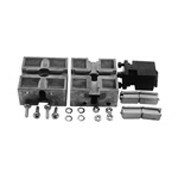 The CLASSIC kit contains all the components of the BASIC kit and much, much more: Indispensable for machine makers is the three jaw chuck for positioning of a metal slug, the clamping jaw for accurate fixing of the included high-speed turning steel, and the three sledges allowing for the ability to work in any angle and any position. MetalLine - Precision makes the difference. After a long period of development we have now been able to extend our UNIMAT system by some full-metal components. The new slides, counter shafts and tail stocks are much more robust and accuracy is improved. 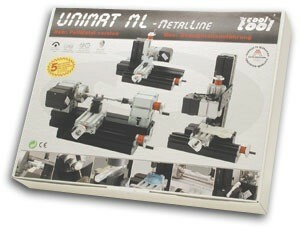 Like the PowerLine also the MetalLine is fully compatible to all parts of the UNIMAT1 System.